has intact cream particles. In other words, it hasn’t been homogenized, and the cream rises to the top. You can see how much (or how little) cream is in your milk! 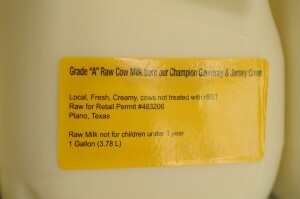 is from cows and goats raised on pasture, whether they are 100% grass-fed or supplemented with grain. is from family farmers, not factory farms. Live in Texas? Download our Fact Sheet about the bill in the Texas Legislature to legalize sales of raw milk at farmers’ markets and through delivery. And help spread the word with our flyer!